"Today I stand on the stage of deception once again." 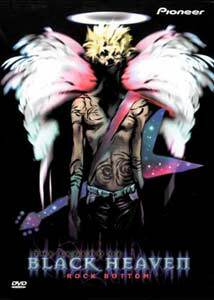 Oji Tanaka (Koji Iahii), now in his mid 30s, has a dead end job and a dead end life, one of the countless faces that make up the office work force; but 15 years ago he was a somebody, a guitarist in the heavy metal band, Black Heaven, who almost made it. The only thing remaining from his glory days is his last "Flying V", which he has kept hidden away for years. Still half asleep as he rises to face yet another tedious day, he doesn't notice the contents of the package his wife Yoshiko (Kae Araki) has left for him to take to the trash: his precious guitar. When he finally realizes what he has done, he falls even deeper into despair, and thinks his last link with the past is gone forever. Until, that is, while drowning his sorrows in sake, a young woman, vaguely familiar, recognizes him from his old band, and offers him a night of passion he'll never forget. As he caresses her neck, she lets out a cry of ecstacy—I'm talking about his newly recovered guitar, of course. In a secret location he is reunited with his true love, and the music he has so long been without. However, this reunification is more than just a fan showing her appreciation, as Uji is now at the center of a story that could change the face of the universe. As a metal fan who grew up with the music of the early 1980s, it is pretty sweet to discover the use of one of the hard rock genre's guitar icons used in the series. For those who don't know, Michael Schenker made his debut at the age of 16 on the first album by rock legends, The Scorpions (Lonesome Crow), alongside his brother Rudolf, both of whom are known for their trademark Gibson Flying V guitars. Schenker would go on to join UFO (whose guitar solo in their hit Rock Bottom would inspire the title for this disc) and his own Michael Schenker Group (MSG for short), the debut album of which is featured numerous times throughout this disc. Also interesting is the fact that another guitar hero from the early 80s, John Sykes of the Tygers of Pan Tang and later Whitesnake, Thin Lizzy and Blue Murder, contributes the theme song. This musical link may not appeal to some of the American audience that much, but given the status of these artists in Japan, it is great to see them included in such a prominent fashion. The story is interesting on several levels. The first is the relationship Oji has with his family. His wife doesn't understand his fascination with the past, or appreciate his need for music. To her, his guitar is just another piece of clutter. His son also doesn't get his father, and sees him as some kind of geek when Uji tries to be cool. The second is the alien force that is looking to Uji to help them out. The team assigned to get him to cooperate introduces a great deal of humor in the process, from their initial introduction performing yoga on the awning to Uji's building (which he doesn't even notice), to some of their more elaborate experiments which I'll keep quiet about, except to say that they place Uji in some interesting situations. As things progress, we see some character development across the board, which adds to the desire to see more of the show. Also, the fact that the lead character isn't a teenager surrounded by girls fauning over him is a bit of a rarity in anime. Overall the series looks like it could be headed in a fresh direction, as certainly the details of its premise is somewhat unique in the genre. For a more mature audience, the presence of 80s music icons is a treat, and the inclusion of some mature content would preclude this from much younger audiences. Old rockers never die, they go on to Black Heaven. This premier disc features four complete episodes, with previews following each installment. The only thing that strikes me as odd with this one is the ending credit roll, which features the three alien girls in bed sleeping together, and a bizarre song about bikinis and sea slugs which I don't quite see fitting with the series so far. Oh well! Image Transfer Review: The 1.33:1 image is quite well-rendered with only a bit of aliasing marring a perfect presentation. Colors are strong with good black levels. This is a solid presentation from Pioneer. Audio Transfer Review: Japanese and English tracks are available, and both are full range with good definition and no audible anomalies. John Syke's Cautionary Warning is the theme song, which is presented throughout the show, and sounds great on DVD. Extras Review: For extras there are the opening and closing sequences shown without credits, plus a collection of 40 conceptual drawings covering most of the cast and auxiliary characters. The main menus are nice with the theme song playing in the background. The disc is encoded for regions 1 and 4. The first pressing features a metalicized and embossed cover design. Black Heaven offers a refreshing change from the standard anime scenario of a teenage boy fighting off a collection of young girls. While it still contains the type of humor one expects from an anime series, the direction the show is heading makes it somewhat unique. Older audiences may appreciate the 1980s musical references. Perhaps not for all audiences, but I quite enjoyed it so far.